After showing a love for horses, Laura was enrolled into Samford’s Riding for the Disabled and had a natural ability to become one with the horse. 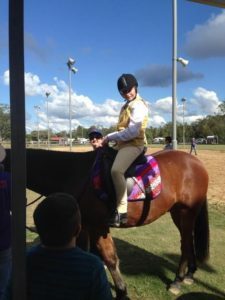 Laura has since competed in the State Riding for the Disabled Association’s Championships in Caboolture. Showing her true ability at the championships, Laura presented herself with pride in the competition. Born with intellectual impairment, Laura has now completed school and has the ability to have private lessons to enhance her skills on her horse. Laura’s sporting goals are to be able to care and lead her own horse, and also to take part in more competitions to show off her skills and gain a sense of achievement.